I know there hasn't been a post on here in a while but I've got 2 questions. I just picked up my TM40 mainly for controlling an electric fan set up. I couldn't find a write up for that and was wondering if anyone knew exactly how to do that? Second is that I know the stock 92 maf wont work. I have from my other bird an 03 mustang gt maf. Will that be too big and if so is there any car I can get a maf from that will work? Already did the M5R2 swap. Thanks guys! Pins 32 and 55 are the high and low fan control leads. I haven't looked at the ECM harness to see if there actually a wire on those pins on our cars but they are what you want if you want to wire in to stock ECM fan control. I bought a separate fan controller to run my MK8 fan so I haven't approached that angle. I'm sure that it could be done but don't know how to do it. You'll need to get a piggy back tuning product like the Moates Quarterhorse to tune this anyway so you should be able to get any MAF to work as long as you can get a MAF Transfer Function that's close to the stock 92 MAF. Check with Decipha on getting it tuned to your stock MAF. If you aren't doing significant upgrades to the engine then the stock MAF would work fine. If you are then it appears that the most common upgrade is to a 90mm L-MAF (Lightning MAF) and the starting point for transfer function is something that can be easily found. No times under new system.......yet. Thanks Madd. I will just use my stock maf for now then until I start upgrading. I'll try to find an electric fan wiring diagram from like a 94+ bird to use as a reference and see if that works. That would be a good start. I'm guessing that if you go to a 94-95 Mustang fan wiring then you would see what it actually takes. I'm guessing that there is some kind of relay that you'll connect the two wires to that will serve the purpose but I never looked into it. Plugged in the new ecu and it fired right up. Have to say, it smoothed the idle out pretty good! Still trying to find a wiring diagram for the efan. The 94-95 (5.0) Mustangs used a CCRM.. Which contains High Speed and Low Speed (Cooling Fan) Relays, along with a few other Relays.. The Mustang PCM gathers information from various sensors..Then it sends that information to the CCRM..
Then the CCRM turns on/off the (Cooling Fan) as well as switching from low/high speed.. The 91-93 (5.0) MN12 does not have a CCRM..
Also, Since the 91-93 (5.0) MN12 never came with a stock E-Fan..It never came with any (Cooling Fan) Relays..
That is not to say that you couldn't add Relays..Then use the Mustang PCM to control the (Cooling Fan) functions.. Typically 40 Amp Relays are sufficient in a set-up like this, however if you decide to use a Mark VIII fan you need heavier duty Relays.. Thanks Rayo. That bypass diagram will help a lot! One question. 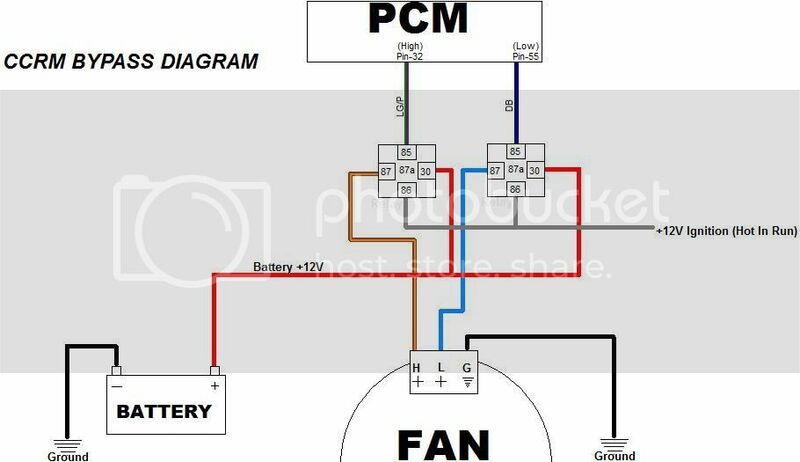 In that diagram, what lets the computer know to kick the fans on? I just noticed this post..Ok, to answer your question..
Like the (5.0) MN12, the (5.0) SN95 has the ECT Sensor mounted in the Heater Tubes.. The ECT Sensor on the MN12 Heater Tubes sends the temperature information to the PCM..
Then the MN12 PCM adjust the fuel trim accordingly.. The ECT Sensor on the SN95 Heater Tubes sends the temperature information to the PCM.. Since the SN95 Mustangs came with an E-Fan..
As well as making adjustments to the fuel trim.. There is no extra wiring involved, all the sensors are already there and in place..
Sweet! Good lookin out man! As soon as I get off my back injury I'll be right back on this beast! Well I just finished the efan conversion on the bird with the mustang ecm and ran the wires from the high and low speeds using the relays and the ccrm diagram and it didn't work. Any suggestions?? Rayo has been kind enough trying to help me with this problem but maybe someone on here has had a similar issue and found a solution. I have the relays for the low and high side fan wired correctly but the fan still doesn't come on at temp. I replaced the ECT sensor hoping for an easy fix with no luck. The computer IS receiving signal from the ECT sensor verified with my volt meter but the low speed pin is only putting out 1.5 volts once warmed up. The high side is 1.5 volts ALL the time but it never changes with temp or A/C turned on. Right now I have the high side wired so it comes on when the key is on but I'd really like for the fan to run off the computer for that factory install look. Not likely that I got a bad computer is it!? Hope not! Thanks for any help!! FYI, I have updated the original post to reflect a new pic. I have the two connectors shown side by side and I have highlighted the differences.